The safety of your family is obviously one of your top priorities. Many homeowners invest a lot of money in security systems, expensive houses in good neighborhoods and a durable garage door. As long as the crime rates remain in high levels and the chance of a burglar breaking into your house is possible, there is a need for extra security measures. Luckily, there are some ways for you to make sure your garage door remains as secure as possible. If you make sure your garage door and all of its different parts are properly maintained, you will be effectively ensuring that your system can't present a security risk to your home. The condition of the springs, as well as the panels and the other moving parts, must be optimal. A damaged panel can be removed much more easily, especially if it is made of wood or aluminum. By regularly inspecting these components and making sure they are replaced in due time, you'll prevent them from becoming too damaged. 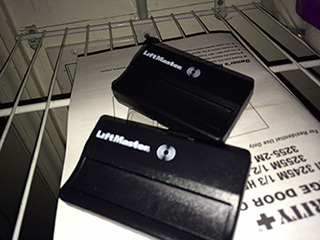 One of the simplest and most effective way to ensure your garage door can't be accessed by just anyone is to keep your opener remote clicker somewhere safe. Whether on a keychain, or somewhere secret inside your home would be great. You also need to make sure it is kept somewhere where your children can't reach it easily. Kids often like to play with large machines, but your garage door is not a toy and must be treated carefully. Liftmaster and Genie garage door openers, among other main name brands, have unique features that allow them to utilize rolling code technology, the Genie Intellicode being a notable example of this. Rolling code technology effectively ensures that the communication codes your opener and its remote use to communicate won't be hijacked by tech-savvy burglars. This technology changes the codes randomly each time the opener is used to open or close the door, so even if they will be intercepted, they'll be useless by then. If you want to make sure your home is as secure as it can be, and are looking for some additional ways to ensure that, then our experts at Garage Door Repair Encino can help. Contact us to get some useful advice.